Saturday I spent a few hours in Italy! No airport security, no jet lag, no checked luggage. 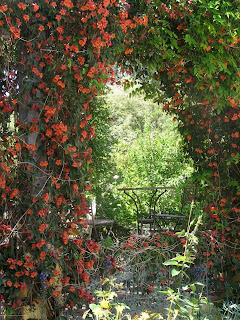 Off my study is a small walled-in courtyard where I grow tomatoes, herbs, strawberries, baby green sand some scent-rich plants including lavender and jasmine. The area is shaded, serene and private. Given a close to perfect 72F temperature, clear sky and sunshine, after finishing some garden clean-up chores, I headed to a comfy chair on the patio and traveled. My transportation, as is often the case with me, was a book. I was definitely going first class. Every Day in Tuscany, Seasons of an Italian Life, is the latest book by Frances Mayes in which she offers more delicious forays into her life in Tuscany. All of her books are rich in imagery, philosophy, history and love. I so enjoy meeting her friends, peeking into her pantry, smelling her blossoming lemon trees, traveling back roads in search of a the work of a specific painter - in this book it's Signorelli whose trail she follows. The beauty of travel book - whether biographies or guidebooks is the roads they allow you to travel from the comfort of home. I take mini "staycactions" almost daily as I read. Sometimes it's a cook book that takes me into souks, bazaars, street markets, other times it's a National Geographic. The recipes scattered through Mayes' Every Day in Tuscany, along with the soft scent of the jasmine, a hummingbird dive-bombing me, and the wonderful glass of Sangiovese I poured for myself around 5:30 p.m., inspired a quickie version of a favorite Sardinian dish - Fregola con Vongole - Clams with Fregola. Fregola is a pasta unique to Sardinia that can best be described as being like tiny, rough pebbles. It's relatively new to this country but some good Italian delis do carry it. I'm still treasuring some brought back from Sardinia. If you don't have any - use orzo. Cook the orzo or fregola per packet directions. Heat the clams in a large skillet as directed on the box. Put the pasta in a shallow bowl - scoop clams and sauces over it, scatter with the basil and a good grind of coarse black pepper. We believe that by connecting women through interests that include travel, cooking, health, relationships and life in general, that we can be supportive of women, form community and work together to empower and strengthen the role of women in society today.